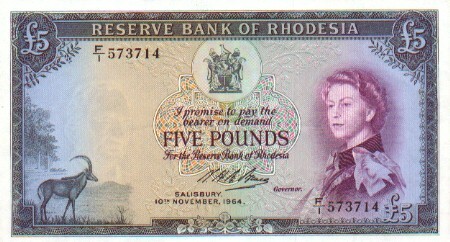 With Rhodesian independence in 1965, the Royal Mint in London refused to supply Rhodesia with currency. 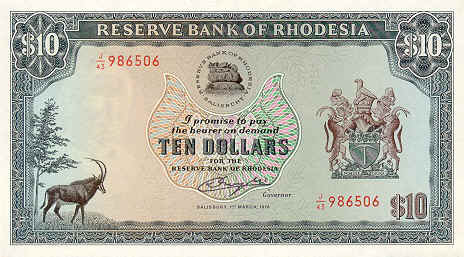 As a result, the Reserve Bank of Rhodesia began to print indigenous Rhodesian currency, very quickly surpassing the quality on offer from London. 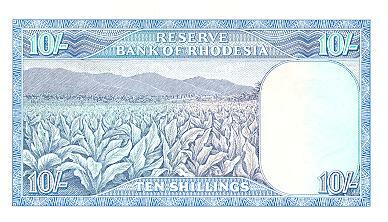 The obverse of all Rhodesian bank notes contains the Rhodesian Coat of Arms in the right panel, and a Rhodesian symbol in the bottom left corner of the left panel. 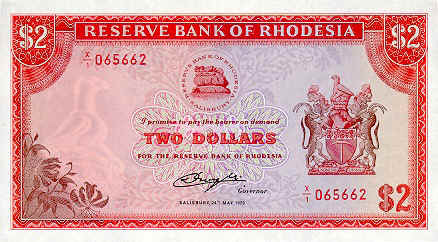 The central portion of the note contains the symbol of the Reserve Bank of Rhodesia, and the declaration and signature of the Governor of the Reserve Bank. The Reserve Bank's logo is the Balancing Rocks – a rock formation 12km (7½ miles) south of Salisbury. The rocks, though weighing many tens of tons, can be set swaying by even the slightest touch, but can never be unbalanced, even with the greatest human force. The Rocks represent the strength and stability of the Rhodesian economy and currency. 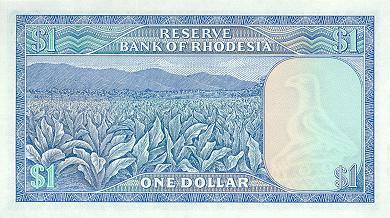 The Rhodesian One Dollar Note contains the Zimbabwe Bird in the bottom left corner of the note's obverse, with a depiction of the tobacco crop on the reverse. Tobacco was one of Rhodesia's main export industries. Rhodesian tobacco was amongst the finest world because of the favourable climate and the fact that Rhodesian tobacco was hand-picked. 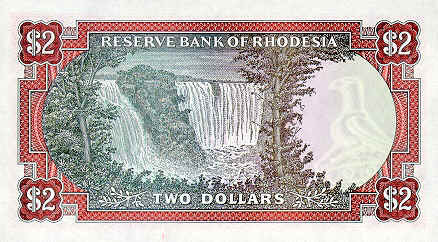 The Rhodesian Two Dollar Note contains Victoria Falls - one of Rhodesia's premier tourist attractions and an example of Rhodesia's natural beauty. The falls were named after Queen Victoria by English explorer Jonathan Livingstone, the first European to see them. 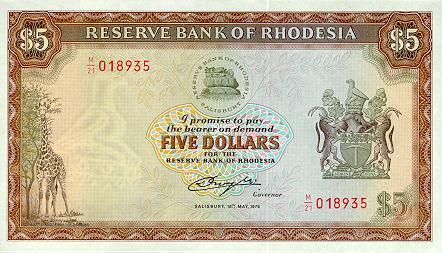 The note's obverse contains Rhodesian native flora in the bottom left portion of the left panel. 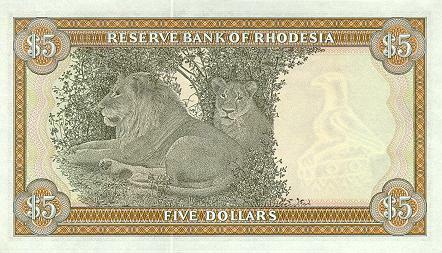 The Rhodesian Five Dollar Note depicts another of Rhodesia's great tourist attractions and natural beauties - lions. The note's obverse contains a giraffe in the bottom left portion of the left panel. 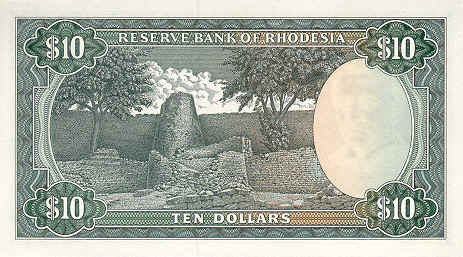 Symbolising the contributions of Rhodesia's indigenous inhabitants, the Rhodesian Ten Dollar Note depicts the ruins of Great Zimbabwe – a Stone Age city built south of present-day Fort Victoria (Masvingo). One of Rhodesia's national symbols, the Zimbabwe Bird, was taken from a soapstone carving found at Great Zimbabwe. The note's obverse contains a native sable antelope in the bottom left portion of the left panel. 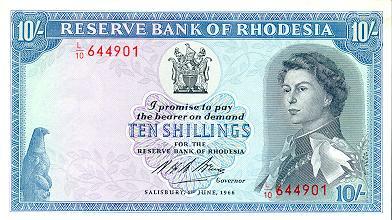 The Rhodesian Ten Shilling Note is similar in design and layout to the Rhodesian One Dollar Note. The major differences are in the wording and in the presence of Queen Elizabeth II, as the British Monarch, on the obverse of the note. 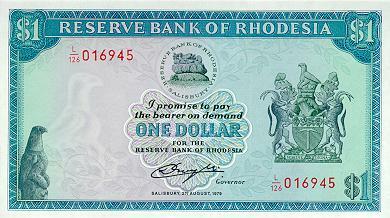 In addition, the Rhodesian Coat of Arms on the pre-decimal notes was replaced with the symbol of the Reserve Bank of Rhodesia. 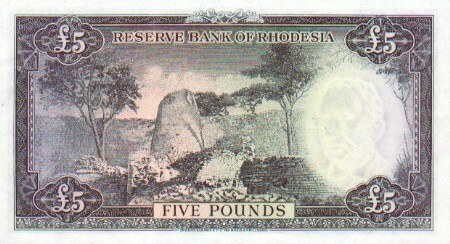 The Rhodesian Five Pound Note, like the Rhodesian Ten Dollar Note, contains an image of Great Zimbabwe. The image on the Five Pound note is, however, slightly different and depicts the city in a more noticable state of disrepair.